How Much Does Custom Software Cost and How to Purchase It? Software apps are essential for all modern businesses which focus on optimizing performance and generating more revenue. Basically, you as a manager or CEO can choose among two large software types: prepackaged solutions based on unchangeable sets of modules and bespoke apps which are fully customizable and adaptable to customers’ needs. Considering the fact that custom programs have way higher potential in terms of ROI, we want to discover how much does custom software cost. Further, we will look at components of the cost, factors affecting prices, and exact rates for different regions. Basically, salaries of software engineers vary from $80,000 to $100,000 (we will cover this point later). When it comes to full projects, prices bounce in the bigger range between a few thousand to several million. Everything depends on business requirements and the desired size/complexity of apps. 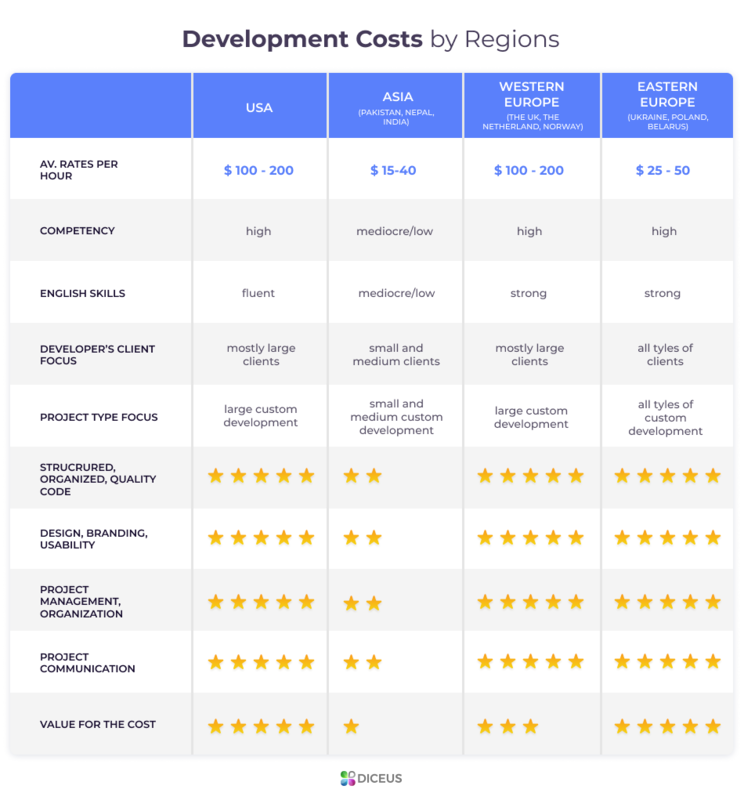 Without further ado, let’s look at software development cost breakdown! Prepackaged applications. Universal combinations of the most demanded modules (e.g. accounting software, HR tools, CRM etc.) which are provided to various clients without customization or with minor changes. Usually, these apps feature initial license price, monthly fees based on the number of users, and extra expenses on upgrades, support, training, and customization. Bespoke software. Applications of this type are unique as developers create them for each partner exclusively. They come with prior analysis, thorough research, MVP release, testing, and so on. Clients can define which modules they want to add or remove to get the best accordance with business goals. Custom soft often features only one payment which includes all expenses. As you see, the second type is potentially more profitable because managers see how much the company has to spend and can be sure that there are no pitfalls. Bespoke apps usually include support, training, and upgrading costs in the final price. Hence, here’s the main question: how much does custom software cost with all these bonuses included? The main thing you should remember for this moment is that custom applications take more time before release than packaged alternatives. The thing is that developers have to make a product from scratch instead of deploying an already programmed software, so clients should be ready to wait. Put simply, the process consists of several stages beginning with initial business research and ending with continuous support. A-and, you’ve guessed it right: each stage has own expenses which affect the price. The next four sections represent the most important steps in software product development. Study them to see how much you will be required to spend. Starting with analysis, the development stage is the essence of a product. During this process, programmers and analysts cooperate with stakeholders to define the vision of the desired application. Here, partners discuss the overall scope with exact modules included, a delivery time, budgets with more precise expenses, extra services like training or maintenance. Ideally, developers start with an MVP to show how the product works. Further, they upgrade the basic product with additional functions, remove redundant ones, link legacy software, migrate data, and so on. The development itself takes from a few weeks up to years depending on the app’s complexity. As a result, you get a fully-working product. Key expenses to know: initial investments on analysis, the price of an MVP, and costs of final versions. Here, the finished application is installed on your server or deployed in the cloud with remote access. This stage should include proper testing and performance evaluation which prove that the software works fine and you will not lose core data or integrations after switching to it. During implementation, round-the-clock control over apps is crucial. Key expenses to know: direct costs of QA testing and data migration plus hidden expenses related to revenue losses during performance recession. Without good training, your employees hardly can get the most of the new software. Usually, developers of bespoke solutions provide in-house or remote lectures and practices with basic info about applications. If this option isn’t included in the final list of services, be sure to ask for it even if it comes with more expenses. Just trust us that independent training will be way more expensive. Key expenses to know: the salaries of coaches and indirect costs of your employees’ worktime spent on training instead of completing their main tasks. Obviously, the development lifecycle doesn’t end after the launch. It continues with the next evaluation, updates, support, and tech maintenance. Similarly to training, these options can come as parts of the price or may be available for extra costs. Again, you want to get them from developers who know how the program works instead of partnering with third-party teams who aren’t as professional with this given app. Key expenses to know: the price of future upgrades and extensions, expenses on the support team, and tech specialists. Apart from basic stages which define software prices, there are also numerous side factors. They’re definitely worth consideration as each point can increase or reduce expenses and, respectively, help the business avoid budget exceeding. The listed factors are common for all software applications regardless of the industry they are developed for but you want to set priorities depending on the market sector and industry-specific requirements. For example, complexity and functions are extremely important for large enterprises which focus on covering all in once. Wherein, integrations with external programs are crucial for businesses which work with different partners. Now, let’s take a look at stuff which affects the final cost of software customization. First and foremost, every project’s cost depends on its complexity. Say, a simple list-based mobile app for a small e-shop which features a catalog and a personal account only will be really cheap. There’s not much to do with this type of software. Instead, huge ERP platforms for multinational banks or logistics teams which require elaborate CRM, warehouse management, and financial security are expensive and difficult to deliver. We suggest defining the desired features at the very beginning, so developers can estimate prices. This point combines two meanings of design. The first one is obvious as it stands for visual elements such as fonts, images or color schemes. Big brands like Starbucks or Amazon invest billions to get a unique design which will differentiate them from a crowd. Even if you don’t focus on creating super-duper visual stuff, you definitely want to get a stand out brand voice, so consider investing in design. Waterfall. In this, all functions are defined before the project’s creation starts. Agile. Here, the creation consists of several sprints with new tasks for each. We in Diceus use the latter approach to optimize the development totally. Firstly, we launch an MVP to show advantages and weaknesses of the software, then start next iterations to add more functions, test stuff, and find the best solution for your current needs. Surely, Waterfall is viable but we think that Agile is the more progressive and beneficial way when it comes to costs. Another important point to mention is third-party links. It’s usual that apps connect with other ones to get the best performance. Whether apps work together with other products inside the company (say, accounting software linked with a WMS to control goods’ flow) or they are integrated with external platforms (like PayPal for e-shops), developers have to spend more time to add these connections. Thus, each extra link will feature more expenses. We’ve mentioned this stuff earlier. The process of verifying, validating, and moving core data from legacy storages to new ones can be pretty difficult, especially, if your company doesn’t have general data standards. Of course, you can migrate information on your own but this decision is risky. Migration done by developers is safe even if it increases the software price. Last but not least, the final price is strongly linked with money you can afford to spend and time you are ready to wait. Basically, these things are inversely proportional because the most urgent projects feature additional expenses because developers have to work harder. It’s essential to know your funds and time expectations before signing a contract, so both parties will be able to discuss terms and reach a final decision. Not only the world’s economics features impact of globalization but the IT industry does this. In different countries, both development teams and freelancers have unequal salaries, so you should study them before partnering with an outsourcing company. Globally, the study by GoodFirms reveals that prices differ in a range between $3,000 and $120,000 per project but everything depends on requirements here. Your costs can be lower or higher and the region where developers are located influences these numbers significantly. How Much Does It Cost to Hire a Software Developer Overall? As you should understand now, salaries and projects’ costs are extremely different as they depend on multiple factors from software goals to technologies used. Generally, software engineers get from $80,000 (Glassdoor data) to $108,000 (Indeed data) per year but these numbers are rounded significantly. For instance, an intern in the USA gets about $19 per hour which sums up to $35,000 per year while the principal developer has more than $150,000 per year. At all, you should focus on quality, primarily. Thus, we suggest evaluating the costs of whole projects instead of hiring freelancers. By cooperating with development teams that charge fixed one-time payments instead of hourly rates or salaries, you have more chances to get a tailored product which will work without issues. Further, we list some costs for leading areas of the world. Check the table to compare the development cost breakdown (info by GBKSOFT). How Much Does Custom Software Cost in the USA? Being the most expensive region, North America features $20-$250 per hour but when we talk about high-end software, the lowest level moves up to $100. The overall competency of developers in the USA is high and these folks prefer to work with mid/large clients. The USA also is known for its focus on bespoke software. How Much Does Custom Software Cost in the UK? Western Europe and, particularly, the UK is extremely similar to the USA in terms of prices, clients’ preferences, and quality. Developers form the Foggy Albion deliver custom solutions for large customers at rates from $35 to $175 per hour. Similarly, costs rise to $100-$200 for enterprise commercial solutions. How Much Does Custom Software Cost in India? Asia is the cheapest offshore zone for IT developers. India has the lowest rates which start at $10 per hour and cap at $75-$80 per hour regardless of the chosen software type. However, this region features relatively low tech and coop skills plus high cultural differences. Thus, Indian developers prefer to work with SMB clients. How Much Does Custom Software Cost in Ukraine? Eastern Europe and Ukraine are the rising stars of the outsourcing market. Prices here start at $25 and can go up to $100 but on average rates are $35-$65 per hour. Advantages of this zone include high qualification thanks to powerful education and ability to work with different clients. Finally, we want to provide a small bonus for all readers who were strong enough to reach this section. It often happens that even companies’ CEOs or head managers don’t clearly understand how their businesses work and what they require. At the end of the day, it’s really important to know your goals and wishes to be able to find the best company and receive a perfectly tailored application. Thus, catch a simple checklist which helps in defining software requirements and understanding the cost of software customization! Who will use the product? Sellers, HR folks, clients. What are the product’s tasks? Process data, work with clients, run reports. How users will access the product? Android, iOS, desktop, cloud. What security measures are required? Multiple levels, encryption, 2FA. Which third-party apps will be linked? IoT, e-wallets, CRM, social media. Which data you will migrate? Customers, partners, history, logs. How the software will be regulated? PCI DSS, HIPAA, FISMA. Do you prefer any technology? Java, PHP, MySQL, React, .NET. Answer these questions and you will end up with a clear vision of the upcoming software solution. As well, we can help with remaining unclear things by providing free consultations and elaborate analysis.